Are you looking for a concealable holder for your Glock 19/19X, 23 or 32 gun? Then why not consider this holster from Concealable Express? Here are the important highlights of this holster which many owners love. Read further and see why you too can benefit from it. This item is a holster that only Glocks 19/19X, 23 and 32 can fit into. 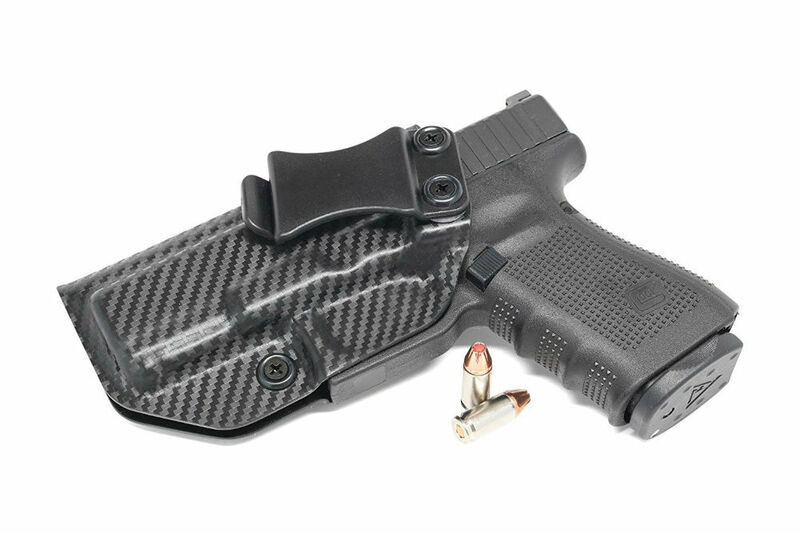 The company, Concealment Express, aims to manufacture an individual holster that’s a perfect fit for different brands. The holsters are extremely concealable and easy to carry. You would think that gun holsters are only made for those in law enforcement or the military, but many people are now regularly carrying guns. Anyone who wants to carry a gun that’s hidden is the perfect candidate for this Conceal Express holster. It’s designed to be placed inside the waistband of your pants. This style hides the holster well. The brand is focused on assisting responsible gun owners and for them, they want to make it easy to attach their holsters. If anyone needs protection, they can take fast action. It’s also safer, because the gun doesn’t move from the holster unless you pull it hard enough. The holster is affordable to those who are first-time carriers of such a weapon. They’ll learn how easy it is to adjust the tension and the carry angles, and why adjusting is important. The easy-to-use features essentially help with a better fit for the Glock on their waistbands. The set is simple to use as it comes with the holster and instructions. You can adjust the screws with a Philips screwdriver, but not that this is not included in the set. Accompanying the holster is a lifetime warranty. If ever you need to return the holster you can, as there are no conditions when you claim for the warranty. This holster has a simple design. It’s lightweight and compact, yet durable. It’s easy to hide and doesn’t leave printing, no matter what you wear. These carry positions are the most comfortable when you stand or sit. The different positions don’t compromise on its ability to remain hidden. Its design flaw may be a weakness; the inner holster doesn’t have any soft lining, so your holster may easily scratch your gun. The holster also protects the gun from moisture. The side of the body that touches your skin has an integrated sweat guard design. Even if you sweat, your gun stays dry. The final feature that you’ll enjoy is the Posi “Click” Audible Retention Lock System. When you attach the holster to your belt you will hear a loud click sound. This signals that the holster is in place and it won't detach when you move. Even after continual use, this system will still work. This YouTube video shows you how to attach it to your belt. First loop your belt to the point where you want to carry the gun. Clip the holster and continue to loop. Take a Philips screwdriver to loosen (left) or tighten (right) the screws so you can adjust the tension. When the tension is tighter, there is a firmer grip on the gun. You can draw the gun out easier with a looser tension. Choose the UMITOM belly band holster if you want a softer material for your gun. This specific item wraps around a belly measuring up to 54’’. The two ends of the band attach by a strong piece of Velcro. The band fits tightly around most bodies and won’t slide around. This belly holster is well ventilated and breathable, which make it easier to wear during warm days. It’s somewhat water resistant so it also prevents any sweat from touching the gun. The versatile holster design is a popular design feature. You can carry more than just your Glock; it can accommodate your money, cellphone, magazine, and other personal items. This Concealment Express Glock holster is still a great buy for your gun. Although there is one minor design flaw, the rest of its fantastic features make up for it. The holster is a perfect fit for the Glocks we all trust. It perfectly shapes to them for a smoother drawing and insertion. This is how you’ll get the most out of owning and carrying your gun.